Ideally, a book is read and stored on a book shelf. However, a framed book, if well done, can look fantastic on the wall. Framing an opened book presents its own unique problems: Gravity acts on the bulk of the pages in an upright position and accurate support must be given to them, they also tend to fall forward and this has to be countered. There is also a difference in height between the open front board (which needs to be supported from behind) and the bulk of the pages. If a book is opened too wide this leads to damage to binding, the spine and the end papers..the list goes on. 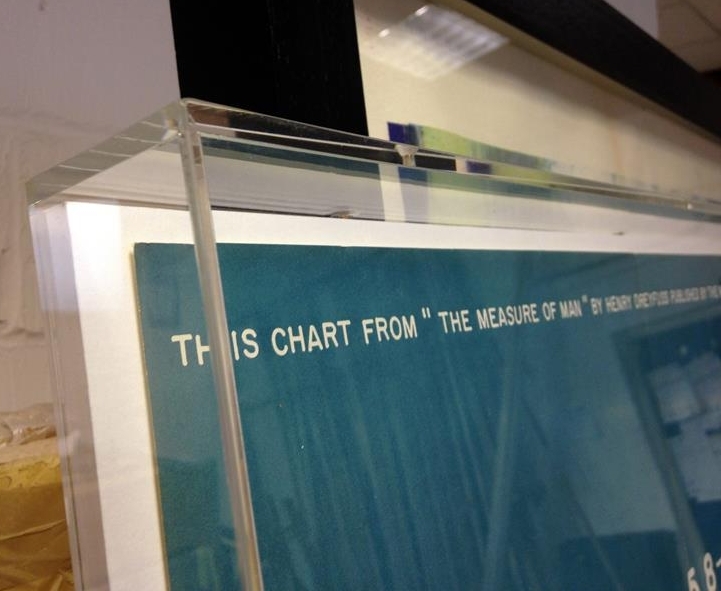 In the example below the brief was to frame the artist's book opened at the signed image. Firstly a card model was made that supported the book and dealt with all the above problems. Then an acrylic case was made to the precise measurements of the card model. Mylar strips were used to prevent the pages opening. The encased book was then mounted in a deep box frame with spacers and glazed in anti-reflection, UV filtering glass. Framed limited edition, Damien Hirst signed artist's book. Framed Damien Hirst Limited Edition signed artist's book. In the following example, the brief was to frame a signed copy of Winston Churchill's autobiography at the signed page with a photograph, a description letter, a brass plaque alongside. The signature was very close to the edge of the page and it was important not to cover it with acrylic. In the studio shot below the layout is shown with acrylic case in position in a gold and black double mount. Signed autobiography of Winston Churchill. Studio shot of an Andy Warhol book in white sprayed box frame. The brief was to create a frame that would allow the customer to occasionally open the frame, remove the book and display different pages. An acrylic case was made that had an opening at the top. Andy Warhol Limited Edition book.